Ever heard of Abraham Masri? He is the first person involved in the jailbreak scene to get his hands dirty after the introduction of Ian Beer’s exploit. Incredibly, beta 3 of Houdini semi-jailbreak has been released by Masri, and it comes with new firmware support for iOS 11.3.1. Read on to learn how to jailbreak iOS 11.3.1 iPhone, iPad or iPod Touch with Houdini. Houdini is not a new name in the jailbreaking world. 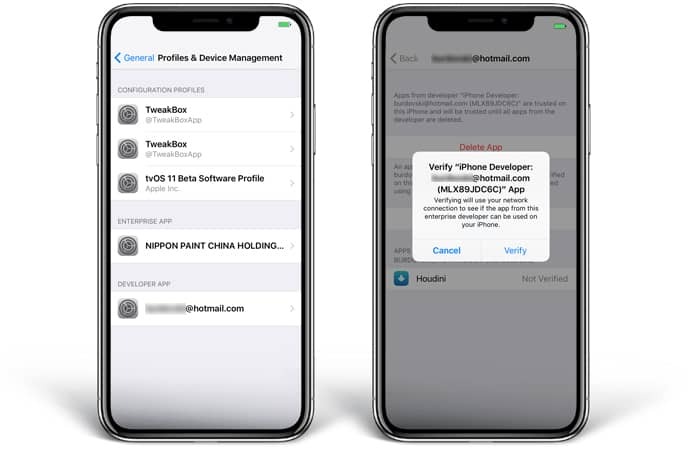 It has been around for some time, offering a semi-jailbreak that enables device owners to access certain functionality and features that would otherwise not be available on a stock iDevice running a default installed version of iOS. It’s worth reminding people that Houdini isn’t a full jailbreak experience like Electra by any means and it doesn’t entirely open up an iOS device for Cydia installation or installation of other packages or tweaks that need Substitute or Substrate installed on the device. However, it provides a fun experience which is associated with some benefits. With the introduction of beta 3 of Houdini, which can now be downloaded in an instant, it’s not just the compatibility from iOS 11.2 to iOS 11.3.1 that is the impressive part. Users also receive new support for Lock screen and Home widgets. The creator has also re-enabled themes in the version, although, the own statement of the developer is that they work partially. Houdini won’t satisfy the cravings of those who want a complete iOS 11.3.1 jailbreak experience, which involves Cydia and all relevant functionality such as read/write access and the installation of favorite packages and tweaks. However, with the availability of an exploit, and a potential Electra update, this release can serve as a stop-gap to entertain individuals who are patiently waiting for Electra’s creator (CoolStar) to do what he does best. If you aren’t running iOS 11.3.1, there’s no need to worry. That’s because the older firmware is still being signed by Apple, implying that users can downgrade to older iOS to benefit from Houdini no, and then Electra jailbreak when it gets released. Learn how to downgrade to iOS 11.3.1 or below. Step 1: Use the download link above to download Houdini beta 3 IPA file. 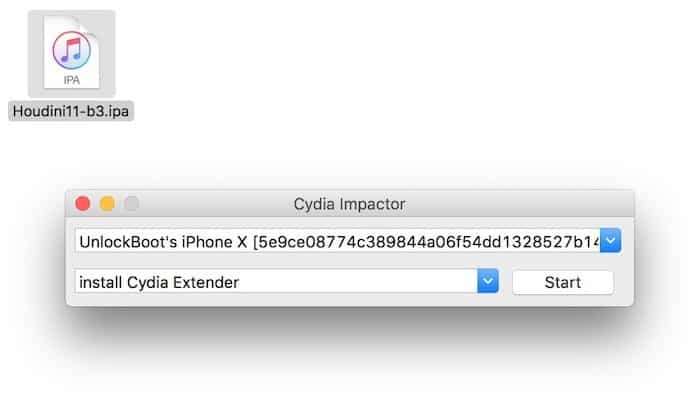 Step 2: Connect the device to the PC and launch Cydia Impactor. Wait till it detects your device. Step 3: Sideload the IPA, drag it over the Impactor’s window to do so. 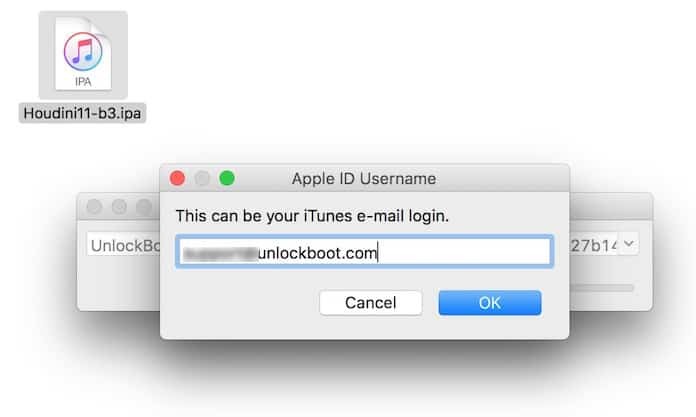 Step 4: Enter your Apple ID credentials. Step 5: Wait till the IPA is sideloaded onto your device. After it’s done, you’ll see the app on your home screen. Step 6: Go to Settings – General – Profiles & Device Management and verify the Houdini app beneath your email. Step 8: Launch the app via your home screen. You can now perform several actions such as clean system, customize your device and respring. Themes aren’t functioning at the moment, so forgo them for now. Theming support for iOS 11 is expected in the near future. It can also be installed with package installers like Appvalley and Tutuapp. We don’t recommend it however as you’ll be bombarded with ads in their applications and jailbreak iOS 11.3.1 tools should always be used from trusted sources. 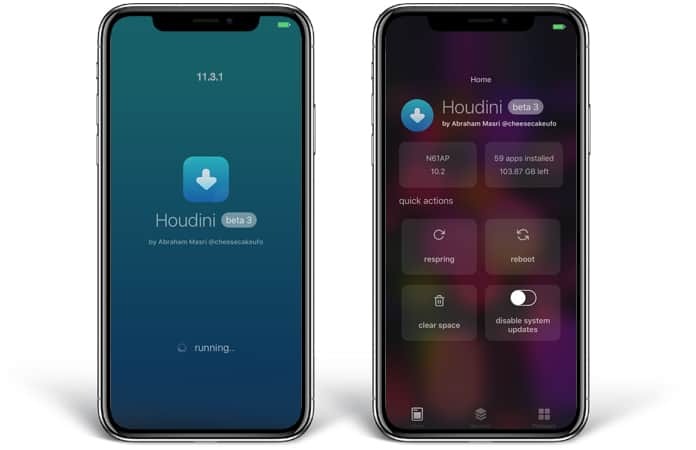 Are you going to try Houdini 11 semi-tethered jailbreak? Feel free to leave comments.